This week on Cafe Chill, we’re chatting about and playing tracks from Bad Snacks, Shatter Hands, Moshun, Handycat and more over a foggy tea latte. Find your local station here. Coming up on your local public radio station is the next episode Cafe Chill, featuring music from Symbion Project, Alaskan Tapes, Custodian and more. Please add together the left and right channels if you prefer minimalism through a single, monaural speaker. On the forthcoming episode of Cafe Chill, we have fresh sounds from Bad Snacks & Lynette Williams and Handycat, from the new Women Of The World compilation. Also some favs from Bibio and Kasseo. On your local listener supported public radio station. Now in stereo. As we sip tea and prepare for another sunrise, we’re finishing up another episode of Cafe Chill for you. This one includes the recent electronic jazz vs ambient efforts of Feverkin and Alaskan Tapes. Also music from favorites Elsa Hewitt, IHF and URBVN. You can listen every week on our partner public radio stations– one is likely near you! Finishing up the latest episode of Cafe Chill– we’re focusing on more a pop sound in this episode with artists like Twiggy Lashes, Chrome Sparks & Angelica Bess, Symbion Project and Barrett Marshall & Sitah. Coming shortly to your local public radio station! …newer music from Gramofaune, Oatmello, and some of your favorites, such as .Sinh & Masego. Don’t forget to listen on your local public radio station! Hope you’ve been able to take some time and relax this week. On the Cafe Chill that we’re prepping for you right now, we’re showcasing sonic art from Imagined Herbal Flows, Paternoster Poetry, Cloudchord x Soul Food Horns, and a ton more. 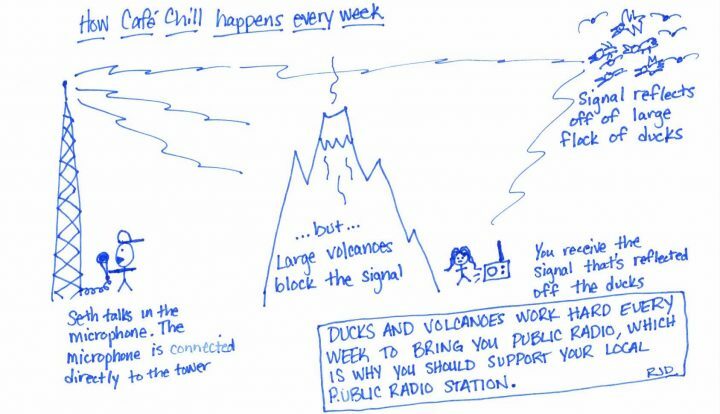 Enjoy your time hanging out with Cafe Chill on your local public radio station. Hope you’re having a great weekend, from your friends at Cafe Chill. This week, we’re featuring tracks from Achun, Sundrenched and Panda Coast, as well as a fresh remix collab between Koresma and Edapollo. Tune in to hear on your local listener-supported public radio station! We’re putting together the next episode of Cafe Chill. As the snow begins to fall here in the Pacific Northwest, we’re lounging in the hot springs of chill and downtempo music, featuring laid back tracks from Izzard, Ian Ewing & A Sol Mechanic, Soft, Petit Biscuit and more. All on your local listener-supported public radio station. Join us as we prepare for the next Cafe Chill on your local public radio station, and you, too, can be wading in a tide pool of chill and downtempo tunes. We’re featuring music from SKYGAZE, Sitkah, Panda Coast and more. So sit back and relax as the low clouds dissipate. Find your local station here.